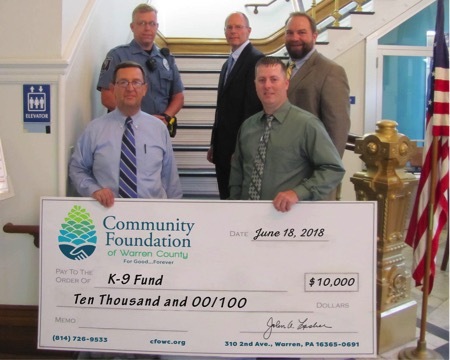 The Community Foundation of Warren County made a $10,000 donation to establish a fund for the purchase, training, and ongoing expenses of securing a new K-9 Officer for Warren County. “The Foundation is pleased to offer support for this important effort in our community,” noted John Lasher, Executive Director of the Foundation. Working in coordination with the District Attorney’s office and the Conewango Township Police Department, the Foundation will make funds available for all aspects of the K-9 program. Choper, the K-9 officer who recently died as a result of injuries suffered in training, was an integral part of the Warren County Drug Task Force. His training also included patrol duties, which encompass another set of skills. He was also a willing participant and great representative of law enforcement in the community. Donations may be made payable to the Community Foundation of Warren County, with a notation for the K-9 Fund. For more information contact the District Attorney’s Office at the Warren County Court House or click here to visit The Community Foundation of Warren County donation page. Pictured in front: John Lasher presents a Community Foundation Check to Conewango Township Officer Scott Neiswonger. In back: Conewango Township Police Chief Jason Peters, Brian Zeybel, Chief County Detective, and District Attorney Rob Greene.